Can Pay Per Click Advertising Can Help Your Business? In a world dominated by competition, the World Wide Web is a vast place where website rankings are of utter importance. However, what if your company is not ranking in the first five slots of your primary keyword, or even on the first page? This can mean a significant loss of clients, possible sales, and visitors to your website and online business. Even though the competition to rank #1 can be somewhat difficult, there is still another method that can impact your small-business significantly if done correctly: Pay Per Click Advertising, or PPC Advertising. Pay Per Click can be an extremely effective and beneficial tool, if the proper advertising strategy is put in place. Today, many small businesses are still somewhat confused or unsure about what PPC is. With that, we are eager to share with you some of the insight that has helped Asset Digital Communications become Toronto’s premiere social media marketing agency. Pay Per Click is an advertising model in which company, brands, or small businesses can market themselves across numerous social media platforms or search engine. This is done at a small predetermined fee, which is technically called a bid. Each time their ad is clicked on, they company will pay that predetermined fee. The sole purpose is to bring in visitors to your website that may potentially turn into customers. With that said, PPC advertising serves as a compliment to your organic reach. The method in which your PPC advertisement functions depends on the platform you are using. If you are using Google or Bing, your ad may show up at the top of the search engine for a specific keyword or search result. These are also commonly referred to as “Sponsored Links”. They can also show up at the bottom of the search results or on the right-hand side. If you want an example, simply search for a specific item, accessory, or service and you will notice at the top 2-4 advertisement spaces with a green square that says, “Ad”. This is where your Pay Per Click Ad may end up, depending on the strength and competition. PPC strategies on social media are much different. However, the result and goal remain the same; to convert website visitors to sales. With that said, the most used social media platform for pay per click advertising is Facebook. Due to Facebook’s in-depth algorithm, functionality, customization, and responsive advertising system, Facebook Ads allows marketers to create an ad that can be displayed on both mobile devices and desktops. The key to success is to follow the platform’s strict guidelines. Facebook Ads, once approved, will be embedded in different areas of Facebook’s Pages, such as: News Feeds and the Right Column Page. It’s vital to know your audience, understand their movements, and know the demographics of your audience. Alongside this, the goal of Pay Per Click Advertising is to be as specific as possible. The more specificity, the more chances you may have to converting clicks into sales. Another useful facet of Facebook’s advertising manager is the ability to attach an Instagram account to a business Facebook page. This will enable the ad to both show up on Facebook and Instagram. Pinterest, Twitter, and LinkedIn also have varying PPC advertising managers and functionalities. What remains the same across all social media platforms is the ultimate goal of converting visitors into customers. With that said, let’s talk about what type of business can benefit from this form of digital marketing. What Type of Businesses Can Benefit from PPC Advertising? Virtually, any small business can benefit from implementing a strategic and intelligent Pay Per Click Advertising campaign. The key is to know your audience, identify the most relevant keywords, and develop a strategy that will convert leads into sales or possible subscriptions. Let’s discuss some businesses that may benefit from PPC advertising. High Profit Businesses – If your small business is in an industry which benefits from high selling price products, then Pay Per Click Advertising can nearly double your investment. Small Businesses in the field of law, vehicle, home, and big-ticket items and purchases can benefit from PPC tremendously. Niche Products – Selling a product or service that may be somewhat rare or hard to find can benefit tremendously from PPC as well. The reason for this is that people rely on search engines and social media platforms to find rare and unusual products. So, if you put it right in front of them, you have created a bridge between your product and their search result. Lifetime Value Services – If your small business is in a field that provides a long-time value service through the form of subscriptions, then PPC is the route to go to bring in more qualified leads. Pay Per Click Advertising does not sound so difficult now, does it? There are a couple key points to keep in mind when utilizing this style of digital marketing. These key points will determine the overall outcome as well as the momentum in which the campaign reaches your audience. We believe that having an overall outline of your process will significantly help your business get started. Let us expand a bit more. What are the keywords you want your small business to show up for? How many advertisements do you intend on having at one time? In the digital marketing industry, we suggest normally running numerous campaigns for a few days to split-test different headlines, images, or videos. What is your financial budget for the campaign or each campaign? When it comes to PPC Advertising, you will be given the option, depending upon the different platform being used, to either pick automatic bidding or manual bidding. It’s highly suggested to do quality research before selecting your budget. Not only is this how you can save an enormous amount of money, it is also the same exact way that businesses can lose money. Once the advertisement has been approved, and this may take a couple of hours, it is important to monitor your ad by frequently checking in, adjusting, and reassessing. If you notice that your clicks are not converting into sales, it may be another issue at hand like unfriendly copywriting and weak headlines. Now that we have covered the different aspects and methods of PPC Advertising, let’s discuss the benefits of Pay Per Click and how overall, it can help your small business thrive in a competition filed industry. One of the biggest benefits of Pay Per Click Advertising is that you have a direct line to your budget always. Therefore, if you notice your small budget is not bringing in as many leads as you intended, you can increase it at any time and vice versa. You can put a cap on what you spend daily, weekly, and monthly, as well as when you would like it to end. Most importantly, you are in control of your budget. With simple statistics about the kind of target audience your small business intends to reach, you can multiply your leads. These statistics may include age range, location, and even buying schedule. With that said, one of the best way to understand your target audience is to know your websites back-end statistics. Who is visiting? What time of the day? Where are they from? From this, you can develop your ideal target audience for your small business and reach them globally and directly. 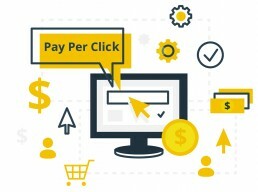 Unlike organic reach, Pay Per Click can show you instant results. Organic search is extremely important for long-term website marketing; however, the ROI takes a longer cycle to show up. With PPC advertisement, you can begin noticing results within the next day, depending on a variety of factors of course. Unlike other marketing channels, which you pay for a banner or ad with no notable results, with PPC advertisement, you only pay per each time a user clicks on your ad. The intention is that each click will bring the user to your online website, subscription form, shop page or other avenue, which will hopefully lead to a sale. With that said, it is not guaranteed that each visitor will turn into a buyer. However, if your target audience is like your current buyer or subscriber base audience, you should notice results. One of the greatest aspects of PPC Advertising is the amount of data you will soon be able to collect from your campaign. For example, each ad will supply information on data and performance as well as impression, clicks, and conversions. These strategies can then be used later to enhance your strategic marketing as well as future advertising campaigns. With that said, with a bit of tech-help from Asset Digital Communications, you can cross-reference where your competition is ranking and build a solid profile of what statistics your competition is utilizing during their PPC Ad. This form of advertisement may seem somewhat confusing, especially if your goal is to spend time on your small business, not spend time learning analytics and click sales. With that in mind, Pay Per Click Advertisement should not be discarded as it can severely hurt your profit margins. The modern form of marketing is digital, it is instant, and will fruit a tremendous ROI, if you have the right team working behind the scenes to enhance your small business to the next level. If you are looking for some more expert tips and advice on digital marketing, we are here to help! Learning how to stimulate business growth and increase profits with the use of digital marketing is not as complicated as people make it. We understand the keys to success and we are ready to share them with you. Sign up today for our weekly newsletter so you can be ahead of the competition.